Park yourself strategically so you can see the kids without missing out on the spectacular ocean views. Palm-lined, lagoon-style indoor pool is the ideal stop when shoulders and noses start looking a little too lobster-like. Kick off those flip-flops, grab a few chairs and lounge beachfront for hours. This resort offers an activities program and kids suites with bunk beds. 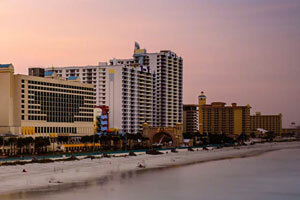 The beachfront setting of Perry’s Ocean Edge Resort keeps vacationers coming back year after year, generation after generation. Get your day off to the right start with free donuts, coffee and juice. Head back to your condo and get changed into swimsuits. Grab water wings and pool toys, slather everyone with sunblock and get ready for some underwater fun in the two outdoor pools. Relax with a cocktail from the oceanfront Mango Sun Tiki Bar. When it’s time for lunch, fire up the poolside bbq grills. Let the little ones help carry hot dogs, sides and burgers and get ready for a fun family cookout. If the weather isn’t cooperating, there’s also a heated indoor atrium pool. Check out the fun activities program for kids, the mini golf course or shuffleboard. Modest studio condos sleep four to five guests. Kitchenettes with refrigerator, stovetop and microwave allow you to prepare snacks and basic meals. Bring the kids along to the Winn Dixie Grocery Store, just across the street, to make sure that no one’s favorites are forgotten. Flatscreen TVs with cable are perfect for catching a Friends rerun. Gather everyone on the couch with a selection of snacks and get ready to laugh. The last thing that you want to do when you come home from vacation is laundry. Thankfully, there’s a laundry facility on-site. Now all you have to do when you get home is unpack. Perry’s Ocean Edge Resort is just under three miles to Daytona Lagoon Waterpark, which features water attractions, activities and rides. There are six main water attractions. Guests must be at least forty-two inches tall to ride Kraken’s Conquest, Blackbeard’s Revenge and Adventure Mountain. Guests forty-two inches and under must wear a lifejacket to ride Treasure Lagoon, Poseidon’s Pass and Pelican’s Drift. Castaway Bay is designed for little ones, fifty-four inches or shorter (grown-ups may accompany their children). Other attractions include mini golf, laser tag, a rock wall, a mega arcade and go-karts. Shopaholics, rejoice. Ocean Walk Shoppes & Movies is just three miles from the resort. Maui Nix features swimwear, surfboards and apparel. Point Break features towels and custom t-shirts. Treat yourself to a pair of shades by Michael Kors, Maui Jim or Ralph Lauren at Sunglass Hut. Hungry? Bubba Gump’s Shrimp Company is a must for Forrest Gump fans. Johnny Rockets is a 50s-style diner that serves burgers and milkshakes. Pizza lovers will love My Pi. Treat the kids (and yourself) with a visit to Angell & Phelps Chocolate Factory. Try chocolate covered Oreos, twinkies and gummy bears. Don’t like chocolate? No problem! They also have jelly beans, Swedish fish, salt water taffy and gummy fruit snacks. Guests who have made ADA requests should contact the property to confirm availability. Please contact the office using the information on the reservation confirmation received after booking. Visit Daytona International Speedway, home of the Daytona 500. Enjoy the rides and arcades along the boardwalk.